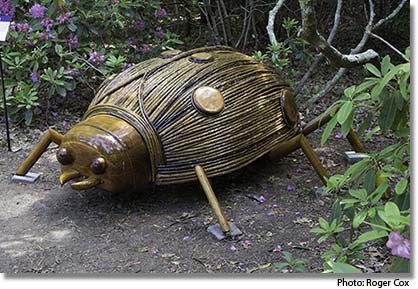 I arrived on Cape Cod last week to find it had been invaded by giant insects. They had taken up positions around the grounds of the Heritage Museums and Gardens in Sandwich, MA. Ants 25-feet long, dragonflies with 17-foot wingspans, ladybugs the size of a bathtub. They arrived all at once on May 31. There are 10 of them all together, all sculpted from wood and forest materials by David Rogers. His collection has been on tour through public and private botanical gardens and nature centers in 40 states, and will be on display here until October 26. I'd come to Cape Cod to play tennis, of course, but that never consumed more than a couple of hours a day, which left ample time for other activities. Heritage Gardens has been around for 45 years but this was my first visit—and won't be my last. Apart from the giant bugs, there were two other special exhibitions: a collection of lovingly restored antique cars dating back to 1899 and "Wicked Plants," a 10-room house filled with a kid-friendly interactive introduction to poisonous, carnivorous, and just plain nasty botanicals as well as some everyday foods whose seeds, leaves, or roots can be deadly. My favorite was how an exclusively corn diet can cause pellagra, whose symptoms may have given rise to the Dracula legend. And my stroll from giant bugs to antique cars to wicked plants took me through gardens and forest blooming with annuals, perennials, daylillies, roses, crepe myrtle, a stop-you-in-your-tracks white-flowered fringe tree, and the last of the season's rhododendrons. I ate my lunch from the Garden's Magnolia Cafe on a bench near the Old East Mill, which dates to 1800. If Heritage Gardens was new to me, the Cape Cod National Seashore certainly was not. There is nothing quite so soul-enriching as strolling its 40 miles of beach and dunes, much of it virtually unchanged since the arrival of the Pilgrims in 1620. In an era when condos and hotels crowd many of our sandy shorelines, it is a gift to be able to walk for miles and only rarely see signs of habitation. What was different this trip was how I went about exploring not only the National Seashore but other parts of Cape Cod as well: I rented a bike. A dedicated bike path, the Cape Cod Rail Trail, extends some 40 miles from Wellfleet, near the Seashore's Marconi area headquarters, all the way to Dennis at mid Cape, with a spur called the Harwich Rail Trail heading east into Chatham. In addition, there are several trails within sections of the National Seashore itself, a 10-mile route from Falmouth to Woods Hole, and an 8-mile stretch along both sides (mainland and Cape) of the Cape Cod Canal, not to mention designated routes in many of the towns. My own afternoon jaunt began in Wellfleet and headed south, through a forest of oaks and pines, roughly 5 miles, before diverting east on a narrow road to pickup up another trail at the Salt Pond Visitor Area. That spur wound through forest, before opening out onto a bridge across marshland and then up to the top of the dunes above Coast Guard Beach, where there are bike racks, restrooms, and outdoor showers. If you like biking, especially biking with a minimum of hills, then these trails afford a very satisfying way of exploring the Cape without having to contend with vehicular traffic. I did not get as far as Provincetown and Pilgrims Monument on this trip, but if you're going to be there July 10-14, don't miss the Charles W. Morgan, the last wooden whaling ship in the world and a National Historic Landmark, which will put in to Provincetown Harbor. There are numerous programs associated with its visit. Meanwhile, for other general information about what's going on on Cape Cod, visit the Cape Cod Chamber of Commerce website. This 217-room gem overlooking the bay and the sand spit for which it's named celebrated its 100th anniversary last week, yet has only had 3 owners in that century. The current owner—himself a tennis player—has lavished $100 million on the resort in recent years, updating all the rooms in the main hotel and rebuilding the beachfront cottages from scratch. Tennis players can look forward to 3 Classic Clay courts overseen by Tucker Lang, an IMG Bollettieri Tennis Academy alum (where he worked with Maria Sharapova and Tatiana Golovin, among others). It has only four HydroGrid courts, but Wequassett stands out both as one of the most beautifully designed tennis facilities anywhere and as the home court of veteran pro Dave Messersmith, who has logged 34 years there. Serial upgrades in recent years have the resort looking better than ever, its rooms scattered through cottages from the bay to the courts, the grounds meticulously landscaped, its restaurants, bars, and swimming pool bathed in views of Pleasant Bay. With hotel rooms and suites in the renovated Mansion on the beach side, and 1-to-3-bedroom villas around a Jack Nicklaus golf course in The Villages, Ocean Edge offers a choice of lodging and not one but two tennis centers: 5 Har-Tru courts at Bay Pines below the Mansion and 4 hard courts at Fletcher in the Villages. Director Jim Leahy runs a full slate of adult and junior clinics, drills, and round robins, with just one central goal: "I want to get every guest involved in our programs and playing tennis. I want people to see tennis as fun." Sprawling through 1,500 wooded acres on Nantucket Sound, New Seabury encompasses two golf courses, a beach club, several restaurants, a tiny seasonal village, and, at 16 hard and clay courts, the largest tennis complex on the Cape. Christophe Delavaut, a video-centric USPTA Elite pro, just began his 4th season here. A sharp-eyed technician, he uses an iPad mini on court not only to video lessons but also compare your strokes on court to an appropriate pro's. Not a resort but a public club with seven meticulously cared-for red-clay courts and one hard court and a willingness to seek out appropriate opponents. A good choice if you're staying somewhere without tennis. What's your tennis-vacation bucket list? Great seats at one (or all) of the four Grand Slam Championships? A trip to the International Tennis Hall of Fame in Newport, RI to play on the grass? For me, the No. 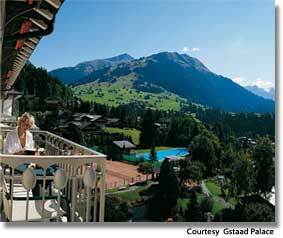 1 item on my list has long been Tennis Week with Roy Emerson at the Gstaad Palace, Switzerland. I'm going to get to check that off this fall. But what's on your list? Share your dreams on TRO's Facebook page. Is this going to be your new after-tennis shoe? OK, even the SoftScience team—which includes the founder and chief designer for Crocs—admits that this early model is not going to win any prizes for style, slyly acknowledging that "this is not the shoe you'll wear on your first date." 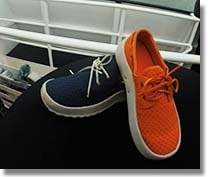 What they have produced, however, is a casual shoe whose injection-molded sole promises supreme comfort. The key to this comfort is a something called Trileon™, a closed-cell foam that makes these shoes ultra-lightweight, impact absorbent, stable, and odor resistant. You're not likely to find them in sporting goods stores yet; check specialty shoe retailers instead or shop online at the SoftScience website. On June 1, Cliff Drysdale Tennis took over management of the tennis operations at two California resorts: the 17-court Omni La Costa Resort & Spa in Carlsbad and the 25-court Omni Rancho Las Palmas Resort & Spa in Rancho Mirage. Bryce Cunningham, a certified USPTA elite professional coach and Tennis Australia Professional Coach, heads up the program at Omni La Costa, after stints at two Florida resorts: The Ritz-Carlton Key Biscayne on Key Biscayne and Bluewater Bay Tennis Center in Niceville. Omni Rancho Las Palmas is being run by Jerome Millet, who played on the professional circuit in France before moving to the John Newcombe Tennis Ranch in Texas, and then to the Cliff Drysdale Touring Team. … Kapalua Resort on the northwestern tip of Hawaiian island of Maui has a new hotel. The Montage Kapalua Bay opened this month of the oceanfront site formerly occupied by the Kapalua Bay Hotel. Lodging consists of 50 residential-style suites, ranging in size from one to four bedrooms, and appointed with spacious lanais and full gourmet kitchens. Guests also have access to the 30,000-square-foot Spa Montage, a fitness center, four restaurants, and free shuttle elsewhere within the 22,000-acre resort, including its 10-court Kapalua Tennis Garden—now overseen by Steve Campbell—and two golf courses. Many of your hotel and resort, air, and car-rental reservations can now be booked directly from Tennis Resorts Online. Just look for the "Reserve" button at the top of the review for a direct link to the booking engine or use the link to Expedia.